Earlier this week, we shared the technical breakdown of the work we did for Qpractice, including a run down of the extensive custom plugin development and functionality we added to the site. I had a chance to chat with Lisa League, designer and founder of Qpractice, to get a more in-depth look at what Qpractice does, why she chose Zao, and her experience working with us. 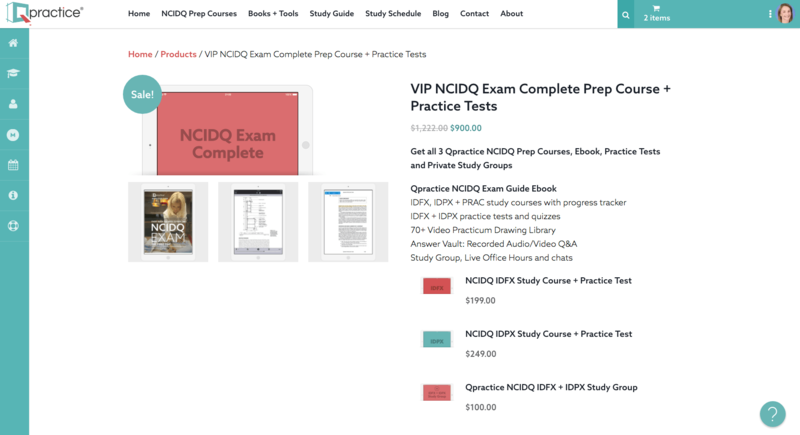 The NCIDQ exam is used in the US and Canada for [interior designer] licensing and certification. I teach several courses that prepare designers to take the exam. Designers who want to move ahead in their career, junior level and senior level designers looking to advance and take on higher paying projects. It’s typically commercially focused, because the exam has to do with health, safety, and welfare, [with a focus on] building codes, accessibility codes, etc. [The test is] not [focused on] interior design or decoration, but regulations and codes–on interior architecture, like the non-structural part of the building, plumbing, electrical, mechanical systems, stuff like that. The exam reviews both what designers learn in school, as well as what you learn on the job. The exam is not available to everyone; you must meet certain requirements in education and years of work experience to be eligible to take it. What was the major reason you needed a developer? I had pretty much done everything myself since I started. I was creating content to work with customers or members, as well as providing customer support and doing the website design and development. I learned how to do quite a lot, but couldn’t go beyond the out of the box capabilities. I wanted to enhance what I could offer to my customers, so I wanted to work with developers. I worked with other developers a year ago, but to be able to continue on, Qpractice needed a team, [rather] than individuals that might get booked on a project [and be unavailable]. I needed the availability, as well as more than one person working on the site, and wanted continuity, support, and ongoing development. How were you handling this before? I was handling it all myself, with some backup from a support team that offers task based support. If it was something I couldn’t do, I would hand it off to them. They were taking one off small tasks, rather than major feature set development. When I needed somebody to take care of one thing or update plugins at night, it worked great, but more extensive features and ongoing development wasn’t within their scope. How did you first hear about Zao? I contacted several well-known, well-respected Genesis custom theme developers and they recommended Zao. What led you to choose Zao over any other agency? I talked to a lot of people, but what it boiled down to was Zao’s follow up and [willingness to] take the time. I hired Zao to scope the project, which provided the kind of feedback I didn’t get from other developers. When Zao [gave a] preliminary look into [the site], they did an excellent job digging in, seeing what I had, what I needed, why I needed it, and what we can do better. Not everybody does that. What were the big successes of this project? I’ve been able to offer different courses and products than I’ve offered before. Now, I can package them together and offer them at a higher price point. I also now offer an e-book for sale and delivery is totally automated, so I don’t have to spend any additional time while it adds to my revenue. [Zao also] improved the product that I have, and make sure everything is kept up to date. We added some things that simplified [my work and the user experience], and offered tools that allow my customers to better track their progress, as well as tools for me to better manage my members and control member access. How has Zao helped you achieve your goals for this year? A website is like a living breathing organism, so it’s always going to need something. They’ve enabled me to take the whole big picture and break it up into parts, do what I need to do now (while making money from that), and then go forward [to the next piece]. It provides an opportunity to regroup [before diving into the next phase] and to profit on what we’ve already developed. Do you have numbers regarding Zao’s impact on your success? I doubled my revenue for the first two months of this year compared to last year. If someone was on the fence about working with Zao, what would you tell them? I would tell them to put the time and money into the discovery/scoping process, because that’s critical. You’d have a really good doctor [take a look] before you go under for a major surgery. You want [a developer] to look at what’s happening, break it all down, figure out what you need and why you need it, as well as any alternate ways to achieve what you want, and then make recommendations based on that. I have put money into software and custom development in the past, only to find it was something I had to scrap. It’s better to spend the time and money upfront and really break it apart, and what you think that you want to do may not be what you end up doing–or it might be, but there might be things you didn’t think of. Zao offers that. Do you have anything you’d like to add about your experience? I just enjoy working with the team at Zao. You don’t want people to just do a job, but you want to hire people you enjoy working with.